If you feel you've mastered rotary engraving and can feel confident with the related techniques, then you are ready for engraving on glass. The techniques for engraving glass and ceramics are very similar to burnishing and the tools are essentially the same. It's okay if you've fast forwarded to this section without reviewing the general techniques for burnishing. We will cover them as they directly relate to this process. Burnishing is the process of removing the surface coating, while polishing the exposed material, and is a method of engraving generally used on brass and aluminum. The technique, cutters and accessory tools may also be employed in engraving glass. The significant differences between burnishing and diamond drag engraving are the type of tool used and the use of the spindle motor. Keep in mind that a burnishing tool does not really "cut" the metal or glass, but is more of a marking technique. For the purposes of glass engraving, a "diamond burnisher" or "rotating diamond" tool is used. A diamond tool will tend to be sharper and will break through the glass surface much better than the traditional carbide tool. A carbide bit will chip or break the glass, so I recommend that you never use this type of tool on glass. The main advantage to burnishing on metals is that the tool produces a wider stroke width than diamond drag engraving, without the need for deeper cuts. The same principal applies to engraving on glass. The process removes only the top surface and gives the glass a frosted look. The application is generally used on coated metals such as lacquered brass where burnishing will only remove the top coating, exposing the bright brass underneath. To the engraver operator, this means that the size of the engraved character can be significantly larger than with diamond drag. On large plaques this is the preferred method. On glass, the diamond frosts the surface giving contrast to the clear or colored surface. In can be effective in glass that is already sandblasted or frosted by a chemical etching method. If you have a computerized engraving system, it would be helpful to invest in a spring-loaded burnishing adapter to use as a substitute for the normal cutter knob at the top of the tool. When properly set, this adapter allows enough pressure to float the burnisher over the surface of the glass and still assures even contact. The adapter is a critical element when burnishing. Due to the nature of the mechanical design most engraving systems apply too much pressure at the spindle, about 6-10 lbs. The adapter by design reduces the tool pressure to about 2-4 lbs. For glass there is no substitution here. Very few engraving systems will give a desirable result without the adapter. It's not worth the few dollars to destroy a perfectly good glass plaque or award. NOTE: The use of the burnishing adapter is extremely helpful when tackling odd-shaped items. Surfaces that are concave or convex where the change in surface height is significant can often times be cut with the use of the adapter. You .can expect to pay about $50 to $60 for a rotating diamond burnisher. The tools come in tip sizes ranging from .005" to .030". Larger sizes are available by special order, but can be very expensive. For Jobs that require a stroke width larger than .030" it would probably be better to work with the graphic to achieve a fill that gives the routed out look. Be sure to notify your supplier when you order a burnishing tool if you are using a burnishing adapter. They will provide you tools with a longer shank about (7"). This is because the adapter is longer than a regular cutter knob. If the tool is a bit short for your spindle, simply remove the nosecone and micrometer ring. These are not used at all when burnishing and you will have sufficient length to float over the material surface. As a diamond burnisher becomes dull from use, it will produce a rougher cut. This can result in the surface becoming chipped. As the diamond becomes dull it must work harder. This can also cause the tip to dislodge from the shank. Diamond burnishers can be relapped when worn. Relapping costs are about 60% of the cost of a new tool so this may not be an attractive option in some cases. If you use a particular size often, it may be wise to keep a spare available. NOTE: Non-rotating (drag) diamonds and rotating diamond burnishers are two distinctly different tools and cannot be used interchangeably. A non-rotating diamond has a pointed, cone-shaped tip, whereas a rotating diamond is wedge-shaped or faceted. At best, running the spindle motor with a non-rotating diamond or trying to drag a rotating diamond through glass will produce a poor quality result. At worst, it will likely knock the diamond out of its shank. Since resetting a diamond is as expensive as buying a new one, at this point your expensive tool will be scrap. The key to good quality burnishing is the amount of downward pressure exerted on the tool. The goal is to achieve enough pressure to evenly remove the glass surface without digging in and leaving a rough cut. The burnisher should "float" across the surface of the glass with a light, even pressure. The engraving system set-up is basically the same for manual and computerized engraving systems. The down pressure should be set at its lowest setting on computerized machines. For the manual operator, down pressure is determined by touch, often by disabling the spindle return spring and allowing the weight of the spindle itself to produce the correct pressure. With this arrangement, be sure to lift the spindle between characters. The procedure here applies to flat glass or crystal plates. Many special engraving systems are designed for round or cylindrical objects such as bottles and glassware. Our procedure directly applies; however, specially designed engraving systems will solve some of the technical issues such as lubrication during engraving. To set-up your machine for burnishing flat glass, first insert the burnisher into the spindle, and adjust it so that it extends below the spindle's nosecone. If the burnisher is too short in length, then you should remove the nosecone and retaining ring from the spindle. Burnishing is done without the use of the nosecone to prevent scratching the glass. The next step is to lower the spindle to its full down position. Using a piece of scrap material, adjust the burnisher by loosening the set-screw so that it makes firm contact with the engraving surface. If you don't want to remove the nosecone, remember at least not to allow the nosecone to touch the engraving surface. Since there will be variations in the thickness of the material you are engraving and in the engraving table itself that may make it not perfectly level, you will need to set the burnisher to touch the lowest point on the engraving material. I call this setting some “over travel” in the tool. This will assure even contact over the entire surface of the material. If you are using a burnishing adapter, you want to position the burnisher so that the set-screw in the adapter is about in the middle of the slot that it travels in. Adjust the spindle motor so that it is relatively fast and the engraving or travel speed about mid-range between slow and medium. The speed is relative to your particular model of engraving system and no specifics will apply, however, when first starting out slow will probably be better. By reducing the engraving speed, the resulting stroke will have a more polished, smoother finish. This will also allow the cutter to better penetrate the material surface. For systems with a dwell setting, reduce the dwell to eliminate the cutter stalling in one area of the cut. One of the challenges to engraving on glass is to have artwork that does not have the tool moving over the same surface area more than once. If the cutter stalls in an area or must travel through an area that was previously cut, the resulting cut will be deeper. If you have the good fortune of using a software package that allows you to determine the rout path, you can have very striking results when cutting glass. This will also give you exceptional results when cutting ceramics such as coffee mugs. The techniques listed work well for both materials regardless of shape. One of the many advantages to having third-party software is the ability to create and modify the tool path. When cutting glass, picking the best cutter for the job and letting the software define the rout path can be beneficial. If you can only cut the outline of a graphic, do so. The more cutting on the glass that you do, the more likely you will have problems. Here I believe that less is better. If you must cut a fill routine to create a shaded area, you may wish to work with a small tool, perhaps a .003-.010" diamond. You will want to set the software fill pattern spacing from .005-.025", about 50% larger than the tool. The resulting appearance is that the tool path will not actually join or even overlap. The cuts will have some gap between them but the results will appear shaded. This has several advantages. The amount of chipping of the glass will be reduced, the engraving speed will be improved and based on the direction of the fill, the shading effect will be dramatic. If the diamond must overlap in the tool path, keep it to a minimum. Remember that you are removing glass and each cut will go deeper. I recommend an s-sweep pattern or hatch fill for best results. The s-sweep keeps the tool in the glass more and reduces the number of cutter ups and downs. The more times you penetrate the surface, the more slight dimples you may leave in the glass. A special note about using "fill routines". Fill routines can be used when the text or graphics to be engraved requires a rout-out appearance or bold look. The vectored image is filled with a tool path that allows for a complete clean out of the engraved area. The operator of the software requires very little knowledge and only basic information must be entered into the software to get the desired results. Usually the information required is confined to the tool size being used (the software calculates all of the tool paths) and the overlapped of each tool path for good clean up. A tool path style is selected base on factors such as the shape of the contour or original image. 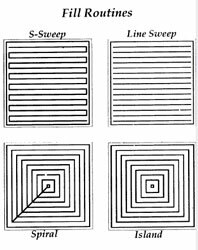 Several fill routines are available and range from an S-sweep, Line sweep (commonly referred to as a "hatch fill"), Island and Spiral. Some programs will allow the operator to select a reverse fill that works from the inside of the object to the outside. This is very beneficial when the nose cone is being used since the nose will always remain on the surface of the material during cutting. If the nose were to fall down inside a previously engraved area it would cause the object to become scrap. If you are engraving on glass, be sure to mist the surface of the glass with a 50/50 mixture of glass cleaner or dish detergent and water to reduce the chances of chipping the glass. Rinse the finished piece thoroughly before wiping to avoid scratching. If the glass is tempered and especially hard, using a burnishing adapter may result in "skipping" of the burnishing tool across the surface. You may achieve better results by changing to a standard cutter knob or smaller diamond tip to better penetrate the surface. Some glass is very hard and a small tip may penetrate the surface better than a large tipped diamond. Here are few tips to help you through the process of engraving glass and crystal. Even cheap glass can cut well. Don't think that very inexpensive glass will not cut well, it does. Many times it may cut better than a more expensive piece. Experiment. Color-fill the engraving to get a greater contrast. In clear crystal or clear glass the engraving may look very good unfinished. The frosted effect from cutting simply looks classy. If the engraving is small on the object or the object lends itself to some use of color, you may be able to paint fill or use common craft paint called "Rub-n-buff". This inexpensive color is used to give an antique finish wooden picture frames but works well on glass. Just follow the instructions on the tube. Don't forget to mask any area that may be attacked by the lubrication. This is especially true if you do wine bottles and champagne bottles. Often times the label is a significant part of the bottle's appeal. Use a little plastic wrap to cover the area and tape in place to keep the fluid from seeping under the wrap. Having trouble centering the engraving on the glass plate or object? Use a grease pencil to mark the area for alignment then wash off. If you do ceramic or glass mugs with handles remember right from left. There are two choices of which side of a mug should be engraved: the side facing toward the person as they are drinking or the side facing away. The generally preferred method is to have the image facing away from the person drinking so that others can see the engraving. It is a matter of preference so give the customer the option. If you decide that an object is simply too expensive to risk or too difficult to engrave, don't forget the ability to just add an engraved plate. This may be an inexpensive and quick solution that satisfies the customer's requirement and limits your risk. Even if you do not plan on offering engraved glass objects, you may want to be familiar with the techniques so that you are prepared to handle that walk-in sale. Experiment with different diamond tools, letter styles and tool paths if possible. The looks can be dramatic.